All of the species orchids described in this and the following two articles have been grown in ‘cosy’ shade-houses in my suburban Melbourne backyard for at least ten years. My definition of a ‘cosy’ shade-house is one with a fibreglass (or polycarbonate) roof and protection from cold winter winds from the south and west. During the last ten years temperatures have ranged from a minimum close to freezing point to a maximum of about 40° C. However, these are the extremes and for the most part temperatures would have ranged from a low of about 4°C in winter to a high of 35°C in summer. 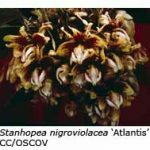 While the orchids listed below would have preferred a temperature range more like 8-30°C, they suffered the ambient conditions without signs of ill effect and flowered each year, although perhaps a few weeks later than they would have done if grown in a heated glass-house. The main precautions to be taken to avoid temperature extremes are to water only on sunny mornings during winter, so that the foliage becomes dry before nightfall, and to water on hot, summer evenings to reduce heat stress. Laelia gouldiana is a spectacular Mexican species that usually flowers in late autumn. Each inflorescence bears up to six large, deep pinkish purple flowers that last in good condition for several weeks. Eventually the plant and its prolific roots will outgrow the pot but it seems not to mind, and grows and flowers quite well in this condition until the pot becomes unstable. Coelogyne mooreana, a native of Vietnam, has upright inflorescences that carry up to eight large white flowers with a striking orange-yellow disc at the base of the labellum. The flowers develop from the centre of the new growths, which mainly emerge during spring and early summer, but may also appear at other seasons. The awarded cultivar ‘William Brockhurst’, which has broad segments and a drooping dorsal sepal, is highly prized. Stanhopea nigroviolacea is one of only a few stanhopeas that can be grown without heat in Melbourne (others include S. tigrina, S. wardii and S. oculata). 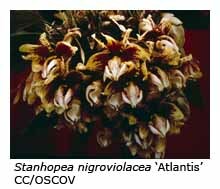 When they reach flowering size, stanhopeas must be grown in hanging baskets to allow their spear-like flower spikes to penetrate the basket liner and the pendant inflorescence to develop. Paperbark or coconut fibre is often used to line stanhopea baskets. When grown without heat S. nigroviolacea usually flowers in January, the yellow and purple blooms measuring over 150 mm across. Each inflorescence usually carries two or three flowers that last for only three or four days. 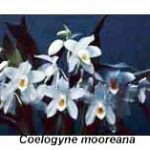 Zygopetalum intermedium is well known for the exquisite perfume of its flowers. Its upright inflorescences carry up to six flowers with greenish petals and sepals covered with brown bars or blotches. The lip is white prominently marked with radiating purple lines. Unfortunately its leaves are prone to develop unsightly black marks, especially if grown without heat. 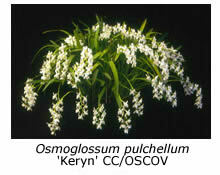 Osmoglossum pulchellum (syn. Odontoglossum pulchellum), a native of Mexico and Guatemala, has smaller flowers than the above four species, but it is highly regarded for its perfumed, waxy, crystalline white flowers that are produced in winter and spring. 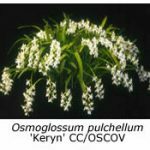 Regrettably, the flowers are prone to fungal spotting if wet, or even if kept in a humid atmosphere, and it is wise to move the plants to a cool spot indoors when they are in flower. Lycaste aromatica, a native of Mexico and Guatemala, probably does a little better if grown with winter warmth, when it usually flowers in November, but gives a reasonable floral display in January if grown in a ‘cosy’ shade-house. 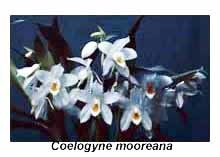 The highly perfumed flowers, often as many as ten from each of the current year’s pseudobulbs, have yellow-green sepals and petals and a yellow labellum.